Fishpond Nomad River Armor edition nets are constructed with a core of carbon fiber and fiberglass, and an outer layer of woven DuPontTMKevlar® fiber and carbon fiber. The result is an extremely strong net with enhanced durability. This composition was designed with the boulder-hopping bushwhackers in mind. Fishpond Ambassador Landon Mayer has been putting these new River Armor nets through the paces during the guide season here in Colorado. "Not only do they look great, but they are now an even better tool for me while on the water. 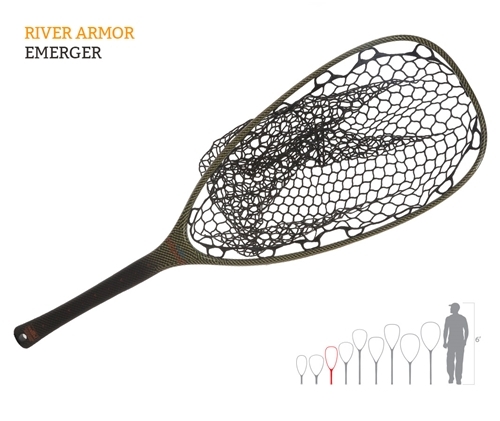 The new Mid-Length River Armor Net is my constant companion on the river taking all the abuse I can throw at it. I ask way more of my net than just a fish netting devise."